I have a couple of sleep trained babies. This means I will finally have the time and focus to capture the research I have been doing and progress that has been simmering in the background. Shoot maybe I’ll drag out the hours of footage I shot last year and post it up onto YouTube. Finally…. That time I went to a grocery store and forgot to buy food. I wanted to do a write up while my memory is still fresh since I have been fortunate enough to go out to a bunch of ramen shops in Austin this week because of work. 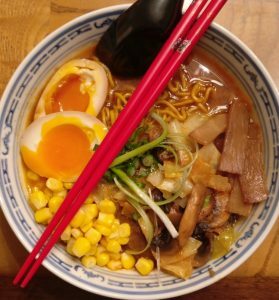 Yoshi Ramen comes to Austin as the sister restaurant to Veggie Heaven, a wildly popular Asian-inspired vegetarian comfort food place….